As you pass through the gates at MGM the Crossroads of the World is right in front of you. It is a small kiosk in the center of the entrance. 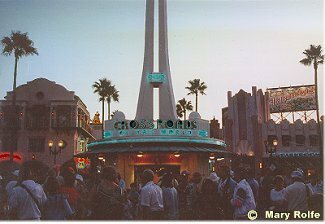 The entrance area is in the shape of a small town square and directs you up Hollywood Boulevard and into the park. The arrangement is much like The Magic Kingdom. And the Crossroads is right in the center of it. Crossroads mainly sells necessary sundries like sunglasses and film. You can get postcards and rain gear here, too, as well as information. However, if you really want info and help planning your day, look left. At the very left of the entrance is Guest Relations, and they've done wonders for me, getting last minute dining reservations and such. Right next to Guest Relations is Sid Cahuenga's One-Of-A-Kind. If you're interested in collection celebrity memorabilia, you have found your heaven. They've got a mind boggling number of genuine autographs, plus items owned and worn by famous people. Considering their value, I thought the prices were reasonable.